You've found the “U.S. Campbell Duck Breeders” page here at Hobby Farm Wisdom! If this is the first time you have visited our site: Welcome! 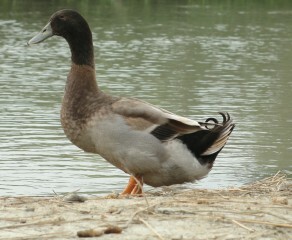 The Campbell Ducks are in the Anatidae Family, they originated in Gloucestershire, England. Campbell Ducks have a lifespan of approximately 10 years and weigh about 4 lbs. Their habitat is domestic and they prefer areas near calm water were they can live with a diet of waterfowl chow and greens. Campbells are also seen foraging underwater for aquatic vegetation and bugs. The Campbell comes in two main varieties, Khaki and white. The original Campbell drakes had a dark green head, grey back, pale claret breast, black stern and white ring around the neck. Female Campbells are excellent at laying eggs, they will lay their first eggs at 5-7 months old producing nearly 200+ eggs yearly. They ducklings will hatch after 28 days of incubation and grow up to be friendly, hardy ducks with a nearly vertical posture dubbing them as penguin ducks.